If you’ve ever watched a famished child trying to concentrate in class, then you’ll know why nutrition is so important to education. A hungry child simply can’t learn properly – and malnutrition upsets sleep patterns too, which makes learning even harder. That’s why Cotlands’ innovative early learning programme goes hand-in-hand with the provision of nutrition, as well as health and psychosocial support. Because young children can’t develop to their full potential if they’re sick or hungry, or if they have problems at home. 315 000 meals to children. It’s a huge leap from nearly 55 200 meals in 2015. Your donations made this possible – thank you! 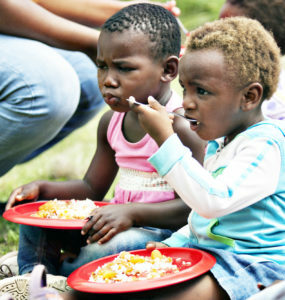 We also provide monthly food parcels to 218 extremely needy families; and 300 severely malnourished children on our extended feeding programme receive a balanced diet. This nutrition makes the world of difference. Not only does it improve concentration and strengthen bodies, but it makes children feel a little loved too! It’s a healing balm for hearts, minds and bodies. Cotlands’s Calendar of CelebrationsA tribute from Vicki!